We offer competitive wages based on experience. Come check us out! Greets and registers guests, providing prompt and courteous service. Checks guests out of the hotel. Resolves guest challenges throughout their stay in our hotel. Upgrades guests as required. Promotes hotel services, amenities, and upsells products to the guests. • Completes the registration process by inputting and retrieving information from a computer system, confirming pertinent information including number of guests and room rate. Makes appropriate selection of rooms based on guest needs. Codes electronic keys. Non-verbally confirms the room number and rate. 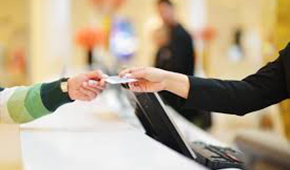 Promotes and administers guest loyalty program for arriving guests. Ensures guest knows location of room, and arranges for team member to accompany guest to room. Provides welcome packet containing room keys, tokens of our appreciation, gifts, etc. to guest. • Ensures rooms and services are correctly accounted for within guest statement. Properly accounts for services provided by the hotel. Assists guests with check out payments or changes. Accepts and records vouchers, credit, traveler’s checks, and other forms of payment. Converts foreign currency at current posted rates. • Greets customers immediately with a friendly and sincere welcome. Uses a positive and clear speaking voice, listens to understands requests, responds with appropriate actions and provides accurate information such as outlet hours, special VIP programs, events, etc. • Receives special requests from guests, and responds appropriately or forwards requests to appropriate team members for decisions and actions. • Promptly answers the telephone and email inquiries. Inputs messages into the computer and advises other team members of special guest needs. Retrieves messages and communicates the content to the guest. Retrieves mail, packages and facsimiles or other special items for customers as requested. • Fields guest complaints, conducting thorough research to develop the most effective solutions and negotiates results. Listens and extends assistance in order to resolve problems such as price conflicts, insufficient heating or air conditioning, etc. Remains calm and alert, especially during emergency situations and heavy hotel activity. Plans and implements detailed steps by using experienced judgment and discretion.